Counterfeit devices of any kind pose a serious risk to fire safety. Included in that group are counterfeit chargers, cords, smartphones, etc. These are typically cheaply made and non-conforming to the safety standards of organizations such as Underwriters Laboratories (UL) and Underwriters Laboratories of Canada (ULC) which test thousands of products to confirm they are safe for consumers. UL’s marks appear on appliances, computer equipment, furnaces, heaters, fuses, electrical panel boards, smoke and carbon monoxide alarms, fire extinguishers, sprinkler systems, extension cords and many other products. You can learn more about the UL marks used in North America and what they mean here. The production of counterfeits appears to be increasing. A 2014 study by the Electrical Safety Foundation International (ESFI) found that seizures of counterfeit products have increased over 325% in the past decade in the U.S. The most frequently reported counterfeit products included lighting, breakers and appliances, all of which represent serious fire safety risks. According to Tom Grace of Eaton (in csemag.com), the risks of counterfeit devices include malfunctions that may cause serious injuries such as electrical shock, electrocution, and death. Counterfeit safety devices are even scarier; they are broken safety nets. Most people won’t realize their devices don’t work until it’s too late. Many consumers will have done due diligence on the most reliable safety product to meet their needs. They find a brand name and model they trust but have no way of knowing the positive reviews for that product don’t apply to what they purchased. In this post, we’ve rounded up some known instances of counterfeit fire safety devices so that you can check yours. Item Type Brand Product Name Notes More Info. Fire Sprinkler TYCO (marked as, not actually a Tyco product) Pendent Type Fire Sprinkler Bears a counterfeit UL Mark for the United States and Canada when it fact it has not been evaluated by UL and may not comply with safety requirements. A detailed description and images comparing real UL-certified Tyco sprinklers to the counterfeits is available at the link. Fire Extinguisher Falsely labeled as Amerex Corporation and Buckeye Fire Equipment – other manufacturers may have been targeted as well. Size B-II dry-chemical fire extinguisher; serial numbers include: V-654690, K-094927, YM-U76222 Detailed information about distinguishing marks and packaging on genuine versus counterfeit extinguishers is available at the link. Fire Sprinklers Tyco (labeled as, not actually manufactured by) TY3351 Not produced by Tyco Fire Products, not tested by FM Approvals. Unknown performance ability. Also have an o-ring type seal that has been the basis for sprinkler recalls in the past. Get additional details at the link. Fire Doors n/a Rolling Fire Doors “Laboratories” is misspelled as “Labortories” and the doors bear counterfeit UL marks despite not having been evaluated by UL and having unknown safety effectiveness. How Insidious Are Counterfeit Fire Safety Devices? Between 2006 and 2011, over 18,000 photoelectric smoke alarms were distributed to Atlanta area residents as part of a fire safety campaign through the Atlanta Fire Rescue Department. They’ve now been identified as counterfeit devices, bearing a fraudulent seal from Underwriters Laboratories. The packaging also advertised a ten-year life lithium battery, though the included battery was a carbon zinc battery with estimated lifespan of one year. The implications are terrifying, not least of all because it shows that “even the most experienced of organizations can be easily tricked into buying counterfeit fire detectors,” (Paul Pope in IFP Magazine). Counterfeits are everywhere. Think you’ve found a new product to keep your loved ones safer from fire? Smart enough to look for the UL seal of approval? Think twice. A California-based company has been fingered for distributing “flame resistant” garments under the Zimpex label, which bear counterfeit UL marks. According to The Counterfeit Report, the clothing has never been evaluated by Underwriters Laboratories and it's not known whether they comply with any safety requirements. How Bad Are The Counterfeit Devices, Really? You may know someone who has purchased a counterfeit purse or sunglasses. When you buy counterfeit fashion, you may not be getting the same quality, exclusivity or aesthetic as you would with the brand item, but you still have a working purse, for example, that you can use. The item still serves its basic purpose─it’s just not “the real McCoy.” Some counterfeit fashions are better than others; in some cases they may be indiscernible from the real thing. So you may be tempted to think that a counterfeit fire safety device might work somewhat decently, that it could serve its basic purpose. Not so. 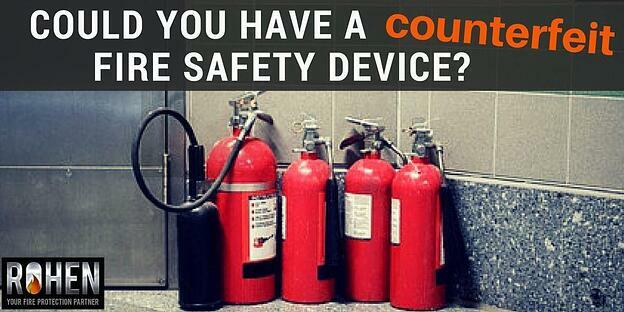 Counterfeit fire safety devices are a total unknown. Similar (but not identical) in appearance, and certainly not in performance. Authentic fire safety equipment is manufactured to save lives. Counterfeit fire safety equipment is manufactured to make money. Cheaper metals are used, obsolete sealings may be employed, so-called fire extinguishers may contain foam that was never even intended to have extinguishing properties. Even before a fire safety device goes for certification testing to a third party such as Underwriters Laboratories, legitimate fire safety device manufacturers subject their products to rigorous internal testing, as described in this IFP Magazine article by Paul Pope of Apollo Fire. Manufacturers such as Apollo, Tyco, Amerex and others vigorously test to protect their brand reputation and also because they are committed to providing products that help save lives. When you buy authentic fire safety devices, you buy reliability, trustworthiness and performance. Who can afford to sacrifice that? How Can You Avoid Buying A Counterfeit Safety Device? It’s safest always to be wary and stay tuned to counterfeit device notifications. But when you buy used devices or buy online, especially on sites like eBay or Amazon from unknown and international vendors, you assume greater risk. A lower cost, especially if significantly lower, is a red flag the product is counterfeit. Where fire safety is concerned, put trust above a bargain. 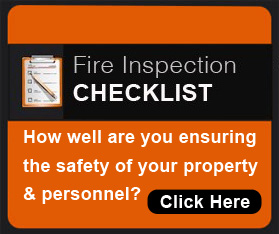 Are you required to install and maintain fire safety devices in residential units? Be sure that your (or your vendor’s) efforts to minimize costs while staying compliant doesn’t result in risk for your tenants. Don’t neglect to ask your provider about how they source your fire safety devices. Enjoyed this post? Subscribe to get more. Image credit: © sasidis / 123RF Stock Photo; modified by text overlay.